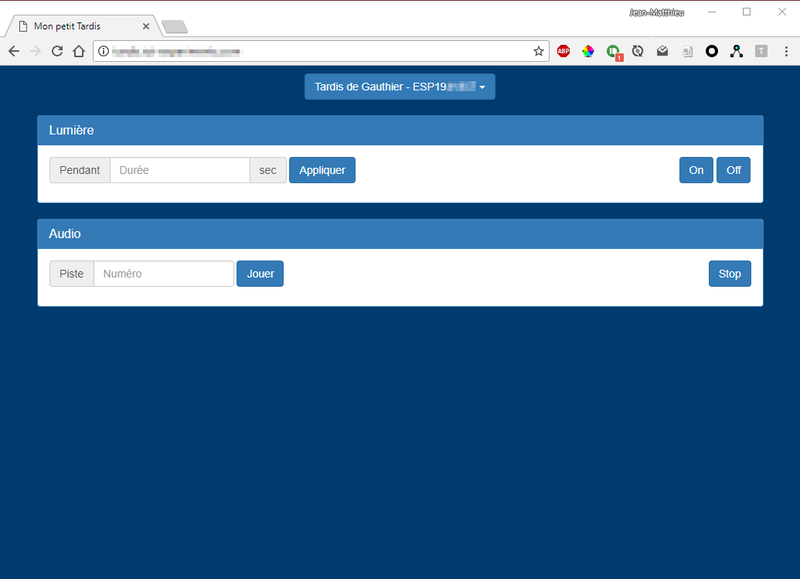 If you read my first article on the audio player, you already now that it was meant to be a connected Tardis. Please note that I'm not trying to create an accurate copy of a Tardis, but a fun one. 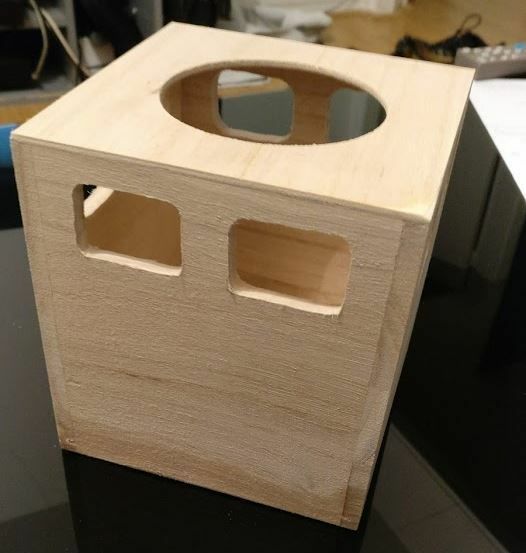 The space between the tissue box and the bottom cover of the box was quite small. I had to create a flat PCB. 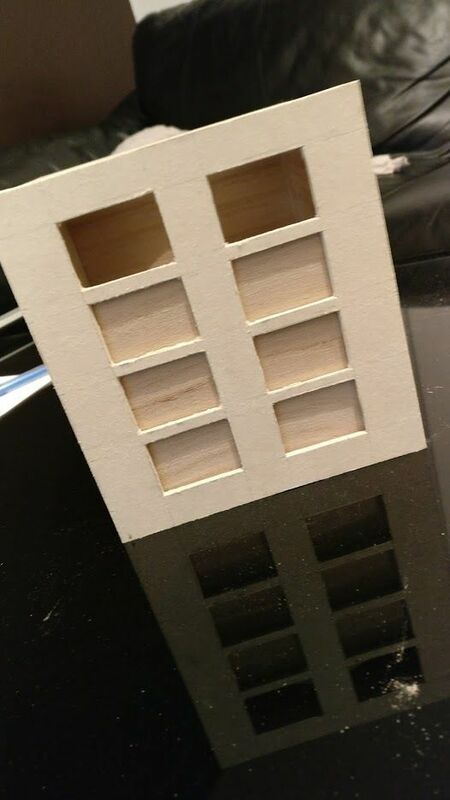 To transform it into a Tardis, I created two windows on each side. 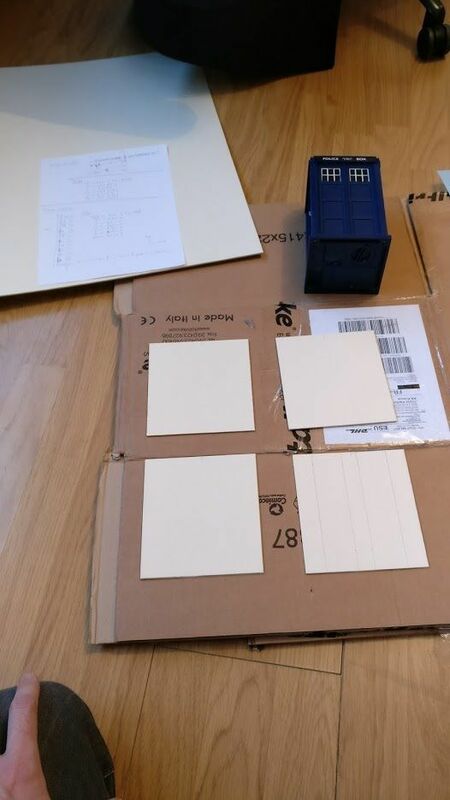 I also bought a wooden sheet to create some grid like each face of the Tardis. 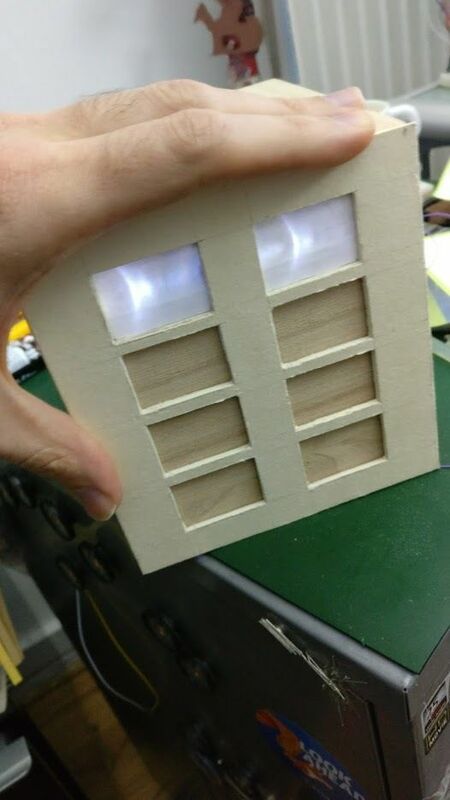 I created to LED string to add a LED in each window. Please note that you have to respect the 1/4W limit of the resistor. 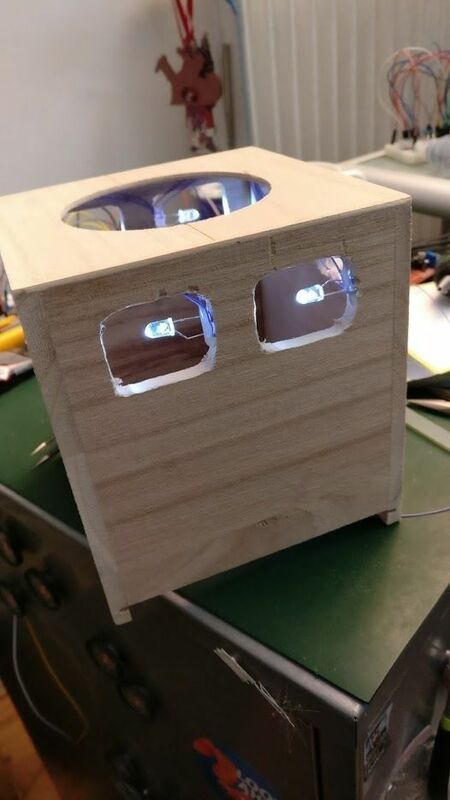 The LED are controlled with a mosfet and PWM. 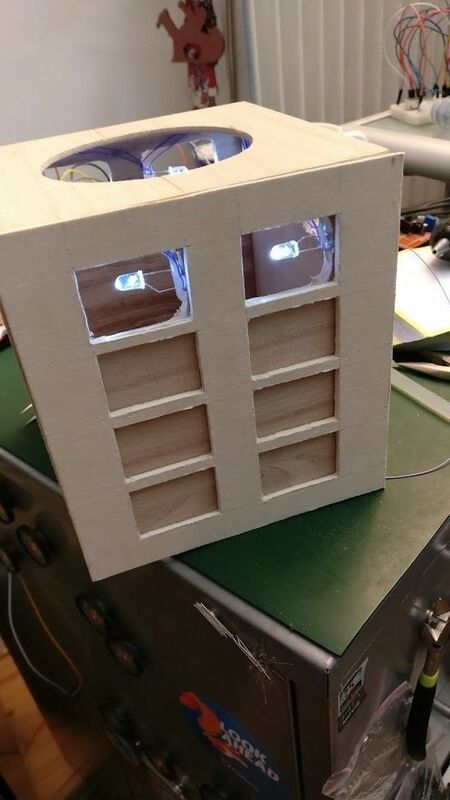 If I had to do a second version of the Tardis, I would use SMD LEDs and fix them on the bottom of each window. 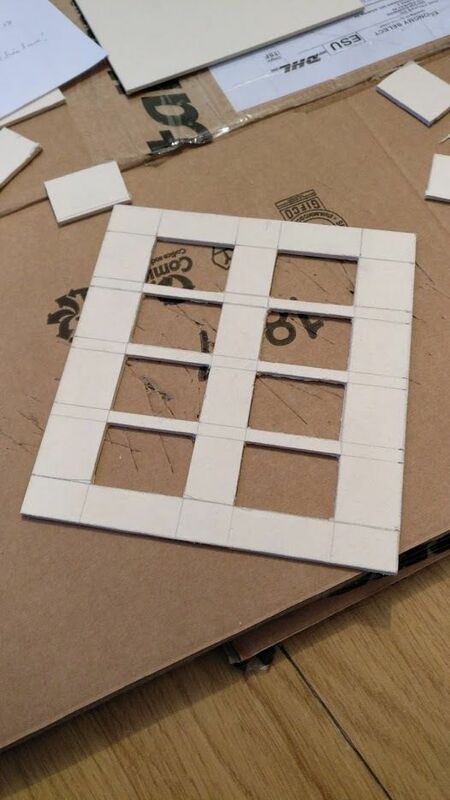 I used a tracing paper for the windows (later I will add a transparent plastic sheet). 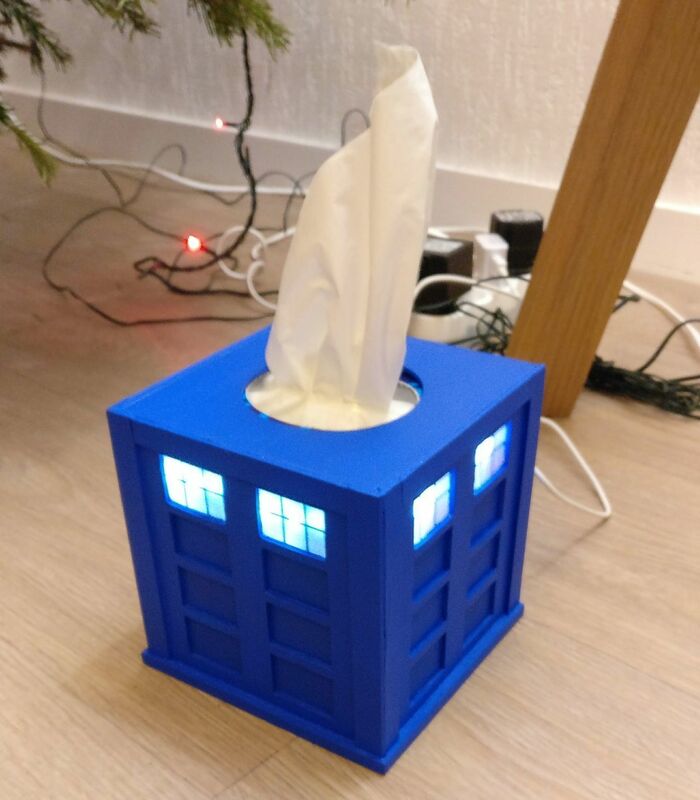 It was time to check if the pulse mode of the Tardis was working with the real circuit and a tissue box inside the cover ! After that, I glued the faces, and added a small border on each side and on the bottom (by adding layers of wooden sheet). 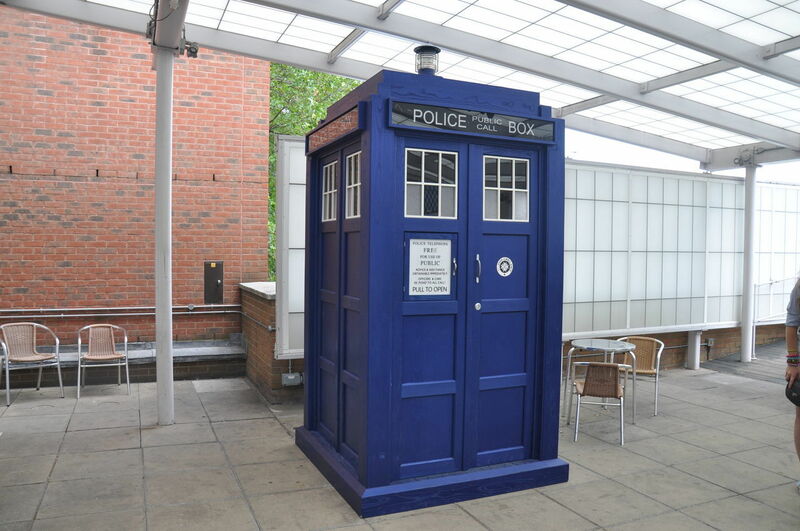 It began to look like a Tardis ! The details of the circuit is available in my previous blog post. 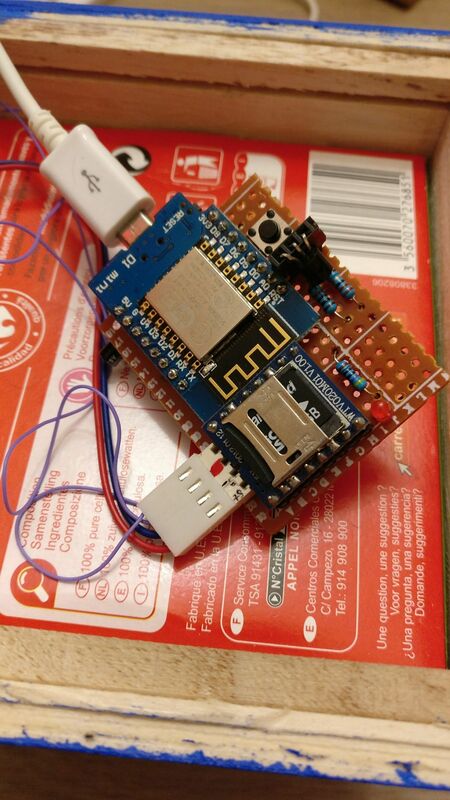 To simplify the circuit, I used a Wemos D1 mini; it is used as main power supply through the USB port, and it's smaller that a NodeMCU board. To control the LED pulse without burning the Wemos, I used a small mosfet, the 2N7000. It was quite a challenge ! If all was working on the breadboard, after being soldered, it stopped working (some current was always passing through, letting the LED always on). 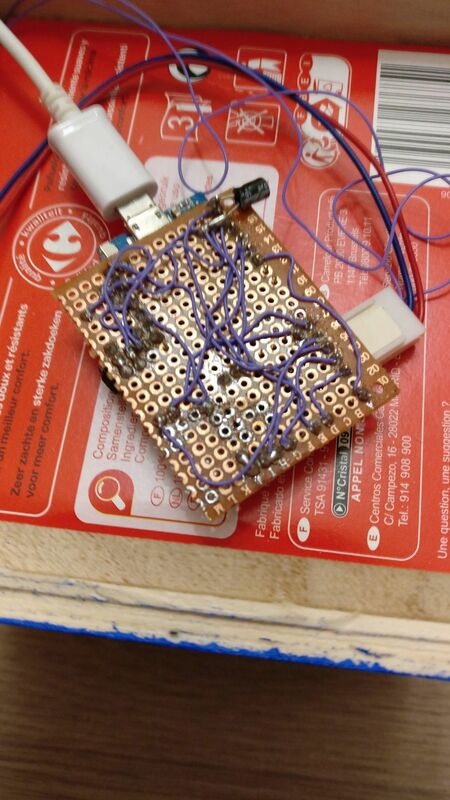 I tried many times, but it was always the same: the mosfet wasn't working as expected. At the end, I added a small 3 pin female header, and I put the mosfet in it. Ugly but it get the job done. 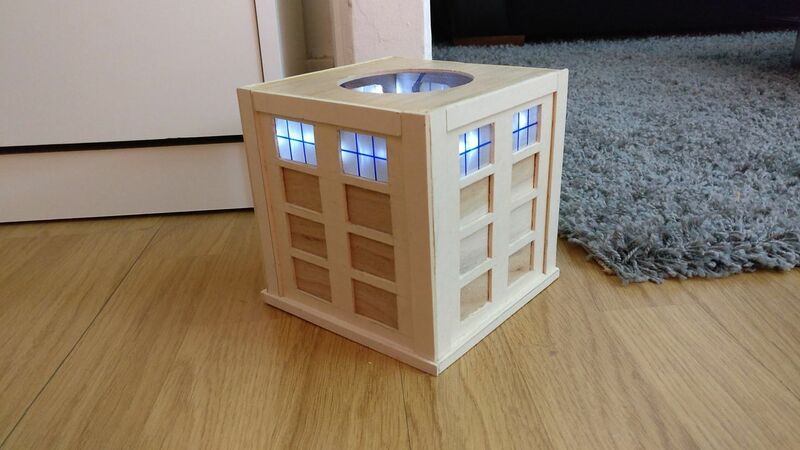 With a little MQTT message to put the light on, or play a sound. 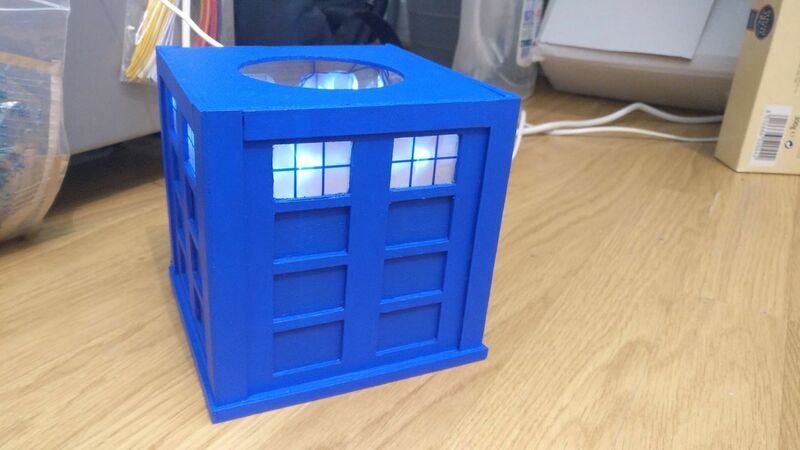 Currently, a website can send some messages to the Tardis, but the idea is to used NodeRed to play a sound when a episode of Dr Who broadcast starts in UK, and power on the LED during the whole broadcast. 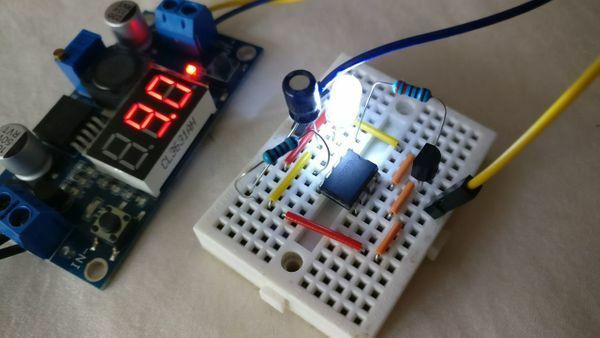 The NE555 timer is quite cheap and using it is quite different than the usual micro-controllers. 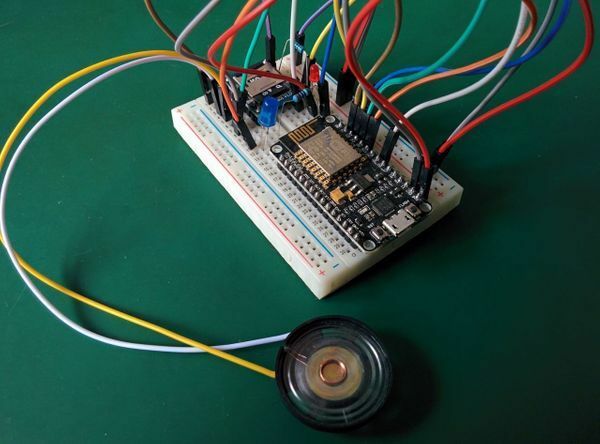 Pulsing a LED is a good way to begin with. 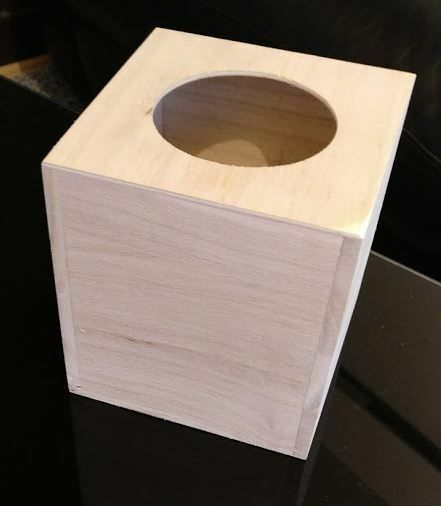 A real IoT device, WiFi enabled, connected to a MQTT server which can play sound on demand!